If you can’t afford the slightly high price of the KONA, then SterlingPro is your best bet. It matches the KONA head to head in terms of efficiency, durability and value. But there are a few features that make SterlingPro unique. Scroll down to discover what they are. filter them through either steel or plastic filters that don’t absorb the essential oils found in them. These reasons result in great-tasting coffee. But mind you, the coffee from Sterling﻿﻿Pro French Press tastes exceptionally better. There are many reasons behind this, but it is the screen that matters the most. It effectively filters out all coarse grounds of coffee - leaving behind a rare and smooth texture that makes coffee taste divine. The manufacturers have included two additional screens as well. This adds immense value to the already valuable package. The design, for one, makes SterlingPro stand out from the rest. It’s simple, yet has a plush finish with only a few stainless steel stripes connecting the bottom and the top. They assist in holding the carafe firmly in place. The KONA, on the other hand, is more aesthetic with a web-like body. This explains the difference in price. The good thing about the design of SterlingPro is that it exposes the carafe more and provides you an unobstructed view on the entire brewing process. You can press down the plunger and witness how well it extracts the flavours and colours from the bare grounds of coffee. 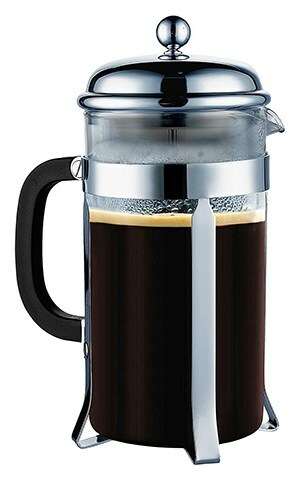 The frame of SterlingPro is sturdier than the other French Presses in this price range. It not only eliminates the fear of breakage, but also protects the glass carafe from slipping out of the frame. What’s more: No matter how snugly the parts fit together, you still can effortlessly dissemble them when the time comes to rinse them clean. When it comes to the durability of a French Press, the glass carafe is the first thing that’ll concern you. The good news is that the carafe of SterlingPro is not brittle. It is made up of borosilicate glass with a thickness of 1.8mm. This enables it to resist thermal shocks much more efficiently than other glass carafes. It may also survive a few falls, but to lengthen its lifespan, make sure you don’t drop it frequently or wash it in a dishwasher. The rest of the machine, except the top, is made entirely up of stainless steel. This includes the filtration system as well. A filter made up of plastic may destroy the texture of coffee, and cause health problems in the long-run. It will also bend over time, and eventually break. A solution to all these is a stainless-steel filter, which is found in this very French Press. It also ensures that you can enjoy a healthy cup of joe for many years to come. This is an 8-cup French Press which can serve around 4-6 people at a time. In other words, it can brew a carafe of 34 ounces. Consider buying it only if this is the capacity you’re in need of. It is also more suitable for indoor use, specially because it comes with a glass carafe. If you’re looking for a French Press for outdoor use, or to stuff it into your backpack as you travel, then search for a French Press with a travel mug. If you can afford a more expensive French Press, then go for a stainless-steel model. Glass carafes will eventually meet their death at an early age than stainless steel carafes - and the replacement cost is almost the price of buying a new one. To be honest, the S﻿﻿terlingPro French Press has hardly any gripes. We came across only a very few machines like this, and none of them came even close to this price range. The parts of the machine is not easy to dissemble. They fit snugly together – which is a good thing. But sometimes they refuse to leave each other, and end up having to be tugged hard. This may make cleaning the machine a tad difficult. But with continuous use, it’ll come off pretty easily. We won’t hesitate to say that the SterlingPro French Press is a rare find. It has the functionality of a high-end machine. But the price tag makes it affordable for anyone in the market to make themselves a hassle-free, delicious cup of joe.